May 20, 2016 | -by: Kevin George. Although Email marketing might strike as old-fashioned and outdated to many, the facts and stats tell a different story. And if this is not enough for you to place Email Marketing as your top priority, let us hear it from DMA report, which states that Email Marketing can help you attain ROI of 4300%! Yes, you read that right! Take a peek into these email marketing tips to use email marketing in favor of your franchise; chant these divine mantras (email marketing tips) scripted by the wise Monks for heavenly results. 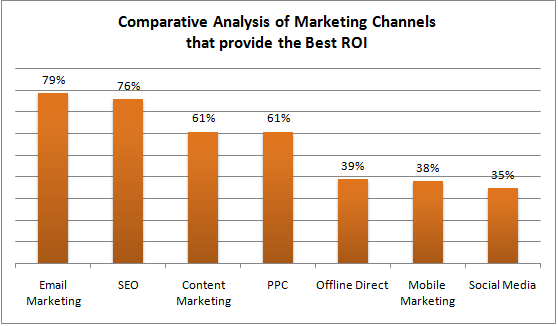 74% of marketers, as per a Econsultancy report believe in the power of personalized emails. Compared to regular emails, personalized ones improve conversions by 10% and click-through rates by 14%. But how personal should you get? Well, just addressing recipients by their name might not be enough; you can take a few more steps forward. To begin with, leverage your MAP and CRM data to pick out the recipient’s interests and needs. Go beyond the regular segmentation based on job level, location, industry, and country. If you hit the bull’s eye, the ROI is bound to rise. 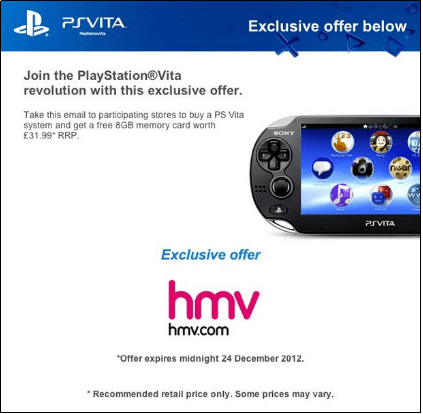 Check out this case study by Econsultancy on Sony Playstation’s email marketing campaign. The campaign was designed to cross-sell the Playstation Vita to their existing subscribers, and also to those who owned a PS3 and were a part of the Playstation Network. The content of the emails was written specifically for each segment. The email which reached over 4.2 million people, achieved an ROI of an estimated 508%. Recipients are intelligent and smart enough to judge the relevance of an email even before they click ‘open’. The subject line is like the face of your email; if you succeed in grabbing eyeballs of the recipient here itself, your battle is half won. But wait, don’t count your chickens before they are hatched. You are here to win the recipients forever. So, the email’s content is where your special flavor comes into the picture. A study on the ROI of email relevance by JupiterResearch found that engaging audience in more relevant communications can increase net profits on an average 18 times more than broadcasting mailing. A well-designed email is crucial if you wish to make a mark; it helps to grab the attention of the recipient right away. A simple design that conveys your message should do the trick; focus more on typography. Flawless coding ensures that the recipient receives the email in the exact format you desire. 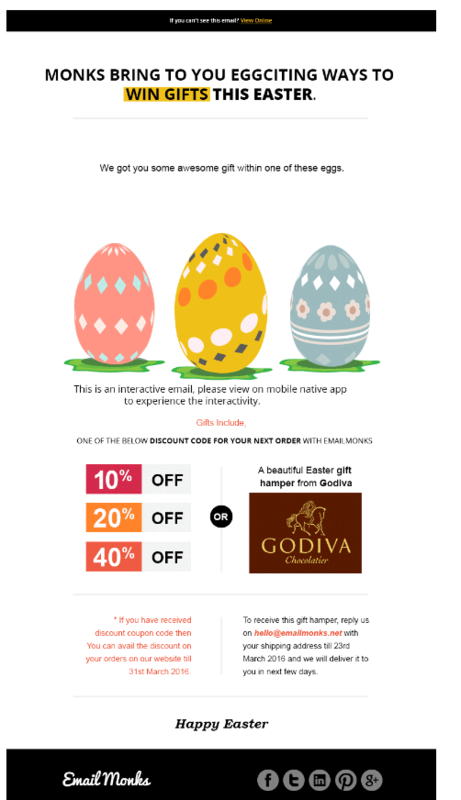 In a nutshell, it is vital that you know the nitty-gritty of designing and coding marketing emails. For any support related to email design and coding of emails, just click here to find Monks at your rescue. A/B tests gauge the strength of your e-mail; so, combine personalization with A/B testing to figure out which version of the email gets the most clicks. Depending on what e-mail service provider (ESP) you subscribe to, you can send out two or more versions of the same email and track the success through analytics. 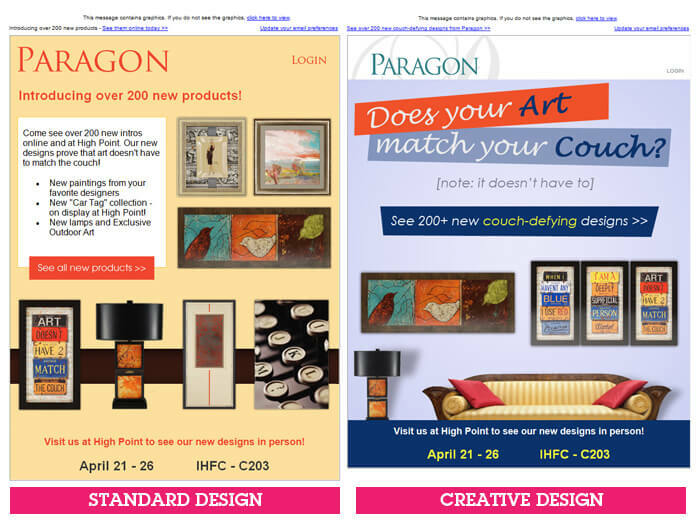 Here is a case study of Paragon, a popular supplier of wall decor, carried out A/B testing with two email designs- a standard and a creative version- to introduce their new products. For an accurate comparison, both were sent on the same day, at the same time. The results revealed that standard design pulled in better results across the board, including open rate, click rate, revenue, and number of transactions. Create a specific e-mail list that allows you to send custom, targeted messages that speak directly of the unique demands of segmented consumers. This way, you reach the target audience, providing them unique content. Also, you can offer solutions that resolve their niche needs – aiding together in enhanced conversions and transactions. Be Social and do it right! Social sharing buttons in your emails can work wonders, especially when it comes to nurturing relationships, brand building, increasing visibility, and generating leads. Sending supplementary eBooks and whitepapers with consistent messages is also a great idea. At the same time, you need to supplement your email marketing with posts across your website and social media platforms. Although Email marketing started out with single generic emails being copied to multiple recipients; with advancement in time and technology, marketers began adopting different ideas to boost their engagement. With 82% of B2C and B2B businesses taking advantage of email marketing technologies today, you must keep pace with the latest interactive email advancements to stay in the race. Go Mobile – Be a Smarty! Data for over 1.8 billion opens from campaigns sent in 2013 shows that mobile is the most popular environment for a subscriber’s first interaction with an email. Hence, remember that your marketing strategy can be termed as smart only if it is mobile friendly and browser compatible. A good email marketing campaign helps you make your presence felt. It also assists in boosting customer satisfaction and increasing brand loyalty. So, let the experts do it for you. Taking help from a reputable email marketing agency will not only lead to creating better campaigns but will also help in analyzing your failures (open and click-through rates), leading to overall success of your email campaigns. A case study of Seatwave (a company that allows music, theater and sports fans to buy and sell tickets in a secure, online environment), shows that using Pure360’s technology to track user behavior, the company has created a highly effective email marketing campaign. The campaign has been so successful that Seatwave’s average open rates increased to 11.18%, and click through rates to 31%. All-in-all, the campaign even drove phenomenal growth in an extremely cost-effective way – delivering an ROI of 1600%. 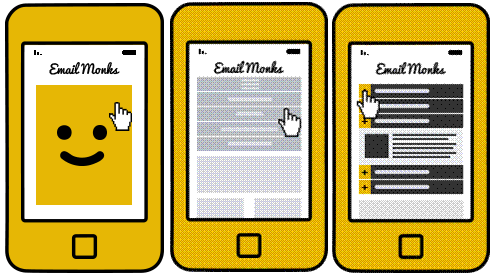 And if these email marketing tips aren’t enough, Monks are here to help you with designing and coding of your emails.